Includes 6 new-for-January-2019 minifigures: mum, dad, grandma, grandpa, girl and boy. Measures over 3â (9cm) high, 11â (30cm) wide and 5â (13cm) deep. 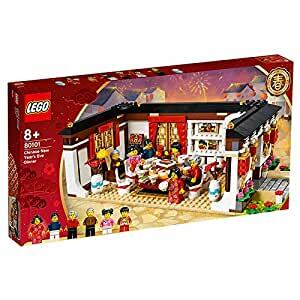 House features an opening front door with Fu symbol sticker, rotating dining table with 6 rotating minifigure chairs, minifigure armchair, bookcase with book elements, family photo stickers, buildable TV with screen sticker, and main window with red curtain elements. Dining table comes with assorted printed traditional Chinese food and utensil elements including including fish, chicken, shrimp, crab, meatballs, soup, vegetables, jiaozi, tangyuan, spring rolls, rice, rice cake and a chopsticks & spoon, plus a bowl and 6 plate elements. Other accessory elements in the dining room include 2 red gift envelopes, 3 spring scrolls, 2 vases with flowers. The front garden features a path with paving stone elements and a green âgrassâ base with flower elements.